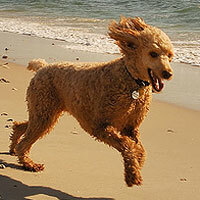 The Poodle is commonly acknowledged to be the most wisely intelligent of all members of the canine race. There is a general belief that he is a fop, whose time is largely occupied in personal embellishment, and that he requires a great deal of individual attention in the matter of his toilet. It may be true that to keep him in exhibition order and perfect cleanliness his owner has need to devote more consideration to him than is necessary in the case of many breeds; but in other respects he gives very little trouble, and all who are attached to him are consistent in their opinion that there is no dog so intensely interesting and responsive as a companion. His qualities of mind and his acute powers of reasoning are indeed so great that there is something almost human in his attractiveness and his devotion. His aptitude in learning is never denied, and many are the stories told of his marvellous talent and versatility. Not merely as a showman's dog has he distinguished himself. He is something more than a mountebank of the booths, trained to walk the tight rope and stand on his head. He is an adept at performing tricks, but it is his alertness of brain that places him apart from other animals. The profuse and long coat of this dog has the peculiarity that if not kept constantly brushed out it twists up into little cords which increase in length as the new hair grows and clings about it. The unshed old hair and the new growth entwined together thus become distinct rope-like cords. Eventually, if these cords are not cut short, or accidentally torn off, they drag along the ground, and so prevent the poor animal from moving with any degree of comfort or freedom. 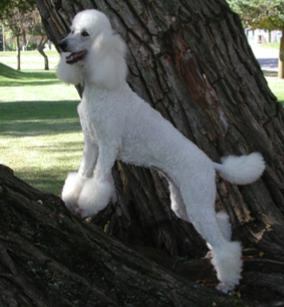 Corded Poodles are very showy, and from the remarkable appearance of the coat, attract a great deal of public attention when exhibited at shows; but they have lost popularity among most fanciers, and have become few in number owing to the obvious fact that it is impossible to make pets of them or keep them in the house. 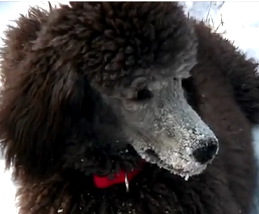 The reason of this is that the coat must, from time to time, be oiled in order to keep the cords supple and prevent them from snapping, and, of course, as their coats cannot be brushed, the only way of keeping the dog clean is to wash him, which with a corded Poodle is a lengthy and laborious process. Further, the coat takes hours to dry, and unless the newly washed dog be kept in a warm room he is very liable to catch cold. The result is, that the coats of corded Poodles are almost invariably dirty, and somewhat smelly. Head: Long, straight, and fine, the skull not broad, with a slight peak at the back. Muzzle: Long (but not snipy) and strong not full in cheek; teeth white, strong, and level; gums black, lips black and not showing lippiness. Eyes: Almond shaped, very dark, full of fire and intelligence. Ears: The leather long and wide, low set on, hanging close to the face. Neck: Well proportioned and strong, to admit of the head being carried high and with dignity. Feet: Rather small, and of good shape, the toes well arched, pads thick and hard. Legs: Fore-legs set straight from shoulder, with plenty of bone and muscle. Hind-legs: Very muscular and well bent, with the hocks well let down. Tail: Set on rather high, well carried, never curled or carried over back. Coat: Very profuse, and of good hard texture; if corded, hanging in tight, even cords; if non-corded, very thick and strong, of even length, the curls close and thick, without knots or cords.